This is Vanifest, my beloved year 2000 Dodge Ram Van 3500. When you live in a van it must be named. Vanifest is the longest model of Dodge Ram Van (19 feet) and had been converted to 4×4 before I purchased it. It also has a 3 inch lift. It’s big and creepy, and it keeps people away when I’m parked at night. I have only been approached twice while boondocking in my van, and I’ve been sleeping in random places since 2010. When I bought Vanifest, I wanted to create a rolling, off the grid cabin. I designed a solar power system and picked out all the components online. I then had a local shop install the components since I don’t have the skills to tackle an electrical project like this (although I hear it’s not that difficult). Below are the components I chose. 130 watt solar panel. This panel is designed for a house, but it also easily attaches to the van roof. It was a good price for the large amount of wattage it provided and that was why I chose it over a specialized vehicle solar panel which tend to be smaller and more expensive. Click on the photo at right to see the solar panel. 200 amp hour, sealed, agm battery. This battery is a beast and weighs over 100 pounds. I had a custom plywood box built for it to enclose it, but for smaller batteries plastic boxes are available. Once again, the plywood box was the cheaper solution. The plywood box is bolted to the floor under my bed and vented to the outside through a small, plastic vent. In the unlikely event the sealed battery offgasses, the gasses go outside through the vent and not into the sleeping area. I didn’t want to take any chances with this huge battery right under my bed. 2000 watt pure sine wave inverter. Being a computer geek, it was important to me to keep my electronics safe while plugged in. The pure sine wave is safer for electronics. Battery isolator. This is a small box which goes under the hood of the Vanifest. It charges the battery from the van alternator when I’m driving. The solar system is spectacular! I can power a 1500 watt appliance for about 5 minutes each day, such as the electric kettle at left which boils water in just a couple minutes. 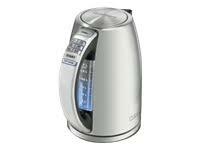 Boiled water is handy for coffee, soup mixes or rice noodles. It allows me to use my propane camp stove less. I also have plenty of power for smaller items like my laptop (and curling iron, blow dryer, haha) whenever I want. The amount of power available is highly variable based on the sun and amount of driving I do, but for my lifestyle it has worked out well. I like to spend time in sunny areas and tend to move around every couple days. I did a lot of calculations to decide how much power I needed, and I recommend you do the same. Then, get twice or four times the battery you think you need. There are two reasons for this. Using up all the power in the battery will damage it over time. It’s best to just sip 50% of the power and only on rare occasions take it lower than 50%. Sometimes you need more power than anticipated. Maybe the sun isn’t strong, or you haven’t done much driving lately to charge the battery from the alternator. In addition to the solar power, I got a few items to make the van experience more comfortable. These items have made the van lifestyle so much better for me and I think most van dwellers would benefit greatly from these items. Engel Refrigerator. This is a wonderful, tough 12 volt refrigerator which uses very little power. I have it hooked up to my sealed battery and it’s draw is so low I hardly even notice it. Click on the picture at right to see the Engel. Ice is expensive and so is ruined food, so I feel this expensive fridge was a good investment. Thetford Portable Toilet. I don’t have any desire for the stress of searching for a bathroom early in the morning, hair rumpled, looking homeless. This porta potti is always ready when I need it, doesn’t smell at all when properly closed, is easy to empty in an outhouse and fits right under the sleeping platform. Mr Heater Buddy Portable Propane Heater. Yes, you can sleep with this heater on but I usually just turn it on in the morning or evening when I relax in the van. It doesn’t use much propane and quickly warms the interior of the van. It has some neat safety features, too, like automatically shutting off if tipped or if the CO2 sensor detects that there is too much CO2 due to the heated area not being vented enough. I just crack a window open in my van and this has never been a problem. 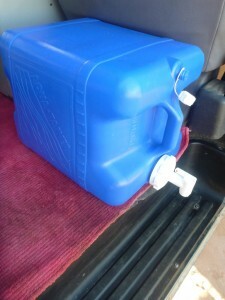 Six Gallon Aquatainer. I went through some other inferior water containers before finding the perfect one. This one seals completely and doesn’t leak, is easy to pour from, and has a flat surface for food preparation. In my Dodge Ram Van, it’s easy to position the spout at the side door over the plastic step. This allows for easy water pouring while cooking or cleaning up. After three years of heavy use, I can happily report that the van is perfect for me and makes my lifestyle pretty comfortable. I have power, heat, water, a refrigerator and a toilet. 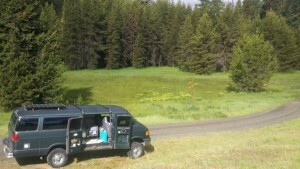 The van is a pretty self sufficient little home. I do rely on dump stations or outhouses to empty the toilet, faucets to refill the water, and propane to run the heater and camp stove. I only need to worry about these things once per week at most, and could go much longer if needed. Now, to decorate the van and make it girly and comfortable. You can read about how I did that here. Hi Lisa. 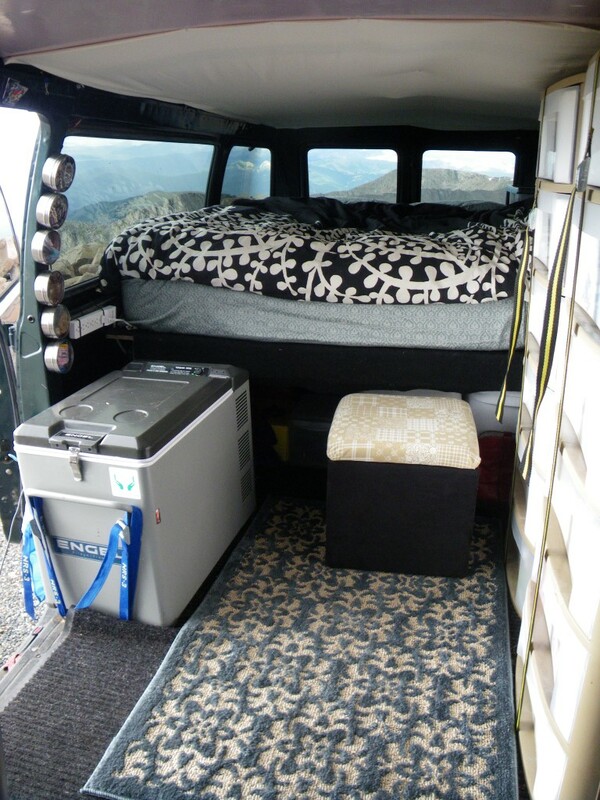 This is great, and I’m going to link to it on my vandwelling/boondocking/vagabonding/WTF am I doing? blog. Hi Roxanne, thanks so much for linking to my blog! I am honored! I just get internet access via cellular networks. I use a smartphone as a wi-fi hotspot but there are standalone hotspots available as well. I have found that Verizon provides the best coverage in remote areas I’ve visited. I also find a cell phone signal booster helps me get even further out and still enjoy good cell service. I use a Wilson Electronics booster and it works well. Thanks, Michelle! I am an aesthetic that enjoys beautiful things. I wanted my van to be pretty! 🙂 Let me know how your motorhome turns out! Great post. Really informative, and fun writing… right now I’m in the planning stages of a vagabond life. You touch all the important bases…. I’m wondering if you have ever tried or if you do use passive solar to heat up water. Thanks. Thanks, Louis! A passive solar water tank on the roof of the van sounds like a great way to have a warm shower. Is that what you had in mind? Is it useful for other things as well? I don’t have anything like that on my van currently. I love that idea. Hi! Very awesome van you have! I also own a dodge ram 15 passenger van, but mine is a 1995. Im curious as to what you had to do to get it converted to solar power? Thats something i would love to do to mine but i don’t know how much it might cost, and does it still have enough power to go fast for interstate travel? also i don’t plan on necessarily living out of it, just mainly used for driving maybe some camping. Any info would be much appreciated! Thanks! Hi Cody, the solar power doesn’t make the van go places, it just powers plug in devices for use inside the van. Hi, Ive got the solar set up and a honda generator but had I had it to do all over again I wouldve just charged up my 6 deep cycle batteries up from the alternator. Mind you I’m an electrician so the wiring part is easy for me. Most of the time I’m in wooded areas with shade plus I dont use much power any way. I mounted a large 12 v deep cycle battery on my front bumper to replace the smaller under the hood battery. I use it more than the other 6 deep cycles I have in back. I agree that the power from the alternator really puts a lot of charge into the batteries, much more so than the one solar panel on Vanifest. Since you’re an electrician, maybe you can tell me if this is true: I heard charging the batteries from the alternator won’t bring them to 100% charge, only about 80% charge. My solar panels were intended to constantly trickle charge the batteries so they stay as close to 100% as possible. Thanks for the comment! I love hearing from fellow vagabonds! google handybobsolar. you can read the whole thing which i have. what the hell, i’m a licensed electrician and a master plumber. well actually that’s all i’m telling as i don’t want to do other things. if i were you i’d read “the history, or how did i end up so angry”. 14.8 volts at the battery. 14.8 volts. your alternator 13.5 volts, may bump up to 14 volts. in other words it will not fully charging your battery. oversizing condutors never hurt anything. good morning. now that i’m awake i will fill in a little. an auto alternator can put out 120 volts, give or take. not long but a surge. (load dump). voltage regulators are the bottle neck and saviors here. they modulate the voltage. basically balance the voltage. they keep the voltage in the prescribed ranges. with out the vr we would have wild voltage until everything burned up. which would be first time we drove. google “peak voltage on auto alternator”, “voltage regulator” and “alternator load dump”. #3 is why we are told not jump cars with our cars. Hi Raz, thanks, that is good to know why the alternator cannot fully charge the battery. Hi, I love your website and I need to ask someone living the life already. I am 41, a teacher, single parent and have a rack of student loan debt. I have contemplating for a long while, mobile living, and while I live with my mom right now to save money, it certainly is not ideal. I had plans to put a small rv or travel trailer in the yard and just live out of it in my mom’s yard, but she’s not having it and frankly I am running out of options in terms of beginning this mobile lifestyle. I considered trailers in a mobile park and 5th wheels but each require a stay in a park, which for a single person, may not be too safe for me. So, my last option is van dwelling. The issue is how do I start small but still get the ball rolling. I don’t want to get one too small but also don’t want to go to big, given issues with parking in the future. I also wonder about convenience of bathing and using the toilet because if I am not stationed at home with the vehicle, it can be hard to find places to shower, etc. I plan to do this mobile thing, but want to be stationary until I decide to set off somewhere and I am planning to quit teaching and find work more suited to my passion. So, do you have advice for another woman with a child that is planning or wanting to do what you do, with limited funds to begin. 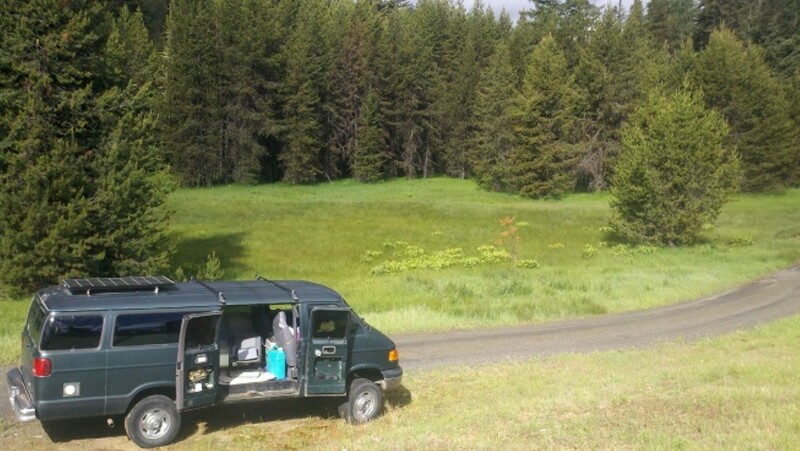 Getting the van might be easy but trying to figure out how to convert it into an rv is beyond me, aside from hiring someone. If I do that, I don’t want to be railroaded with costs!! I know this is long, but I would love to get some insight and advice!! Thanks again for a great blog and for inspiring others! Hi Tiffanei, great questions! You could try van life with your mom’s house as a safety net or a place to go between trips. 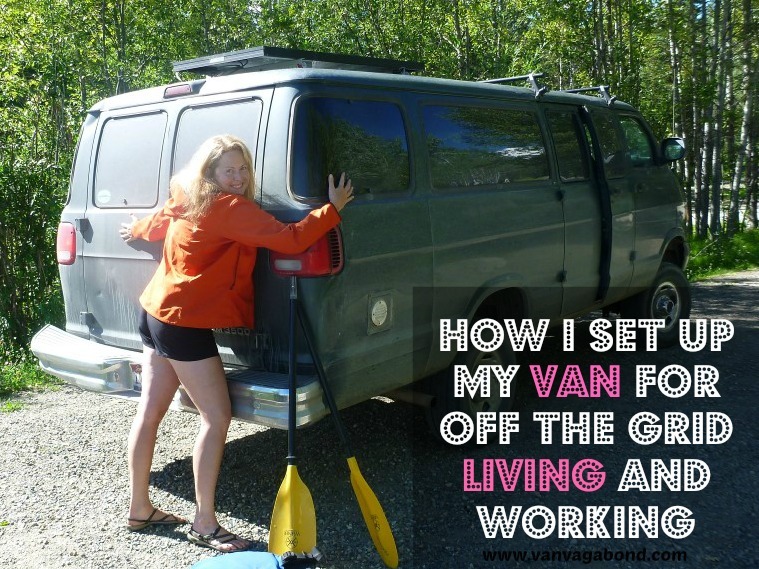 During the first year of living in my van I rented a parking space for $100 per month at a house with some really fun roommates, you may consider that, too. I loved my parking space and my roommates, it gave me security. Later on I went fully mobile with no safety net but it was good to have at first. You can find vans that are already converted, and then you wouldn’t need to customize the van yourself or deal with unknown costs. Showering? Join a gym! This was an integral part of van life for me. Is your child at a good age to go to daycare at a gym? That could work. What part of the country are you in? That would make it easier to suggest parking spaces. Oh, and keep a big can of bear mace in your van! Or some kind of weapon. Just in case. Let us know how it goes! Hi there, so glad I found your site. Love the fact you are a woman out there doing this stuff. I hope you can provide some advice. My husband and I just bought a converted van with a similar setup including the engle fridge (don’t you love it). We have a 200W solar panel. We had two “deep cycle marine house batteries” a 1500 W inverter, and a battery isolator. The problem is that I couldn’t boil water in a 1000W kettle without bringing the system down. So, we upgraded to a 2000 W pure sine wave inverter and 2 750amp AGM batteries and I still cannot boil water without a problem. Sigh! We did our first dry run this weekend, and this was after charging for 5 hours. So, any advice would be greatly appreciated. And, again, love what you are doing! Boil water easily on a gas stove. Either a built-in propane system or with a stand-alone table top butane burner. hi, this is Robert, I have been out there for 5 years. ask me anything, I can help. Robert.